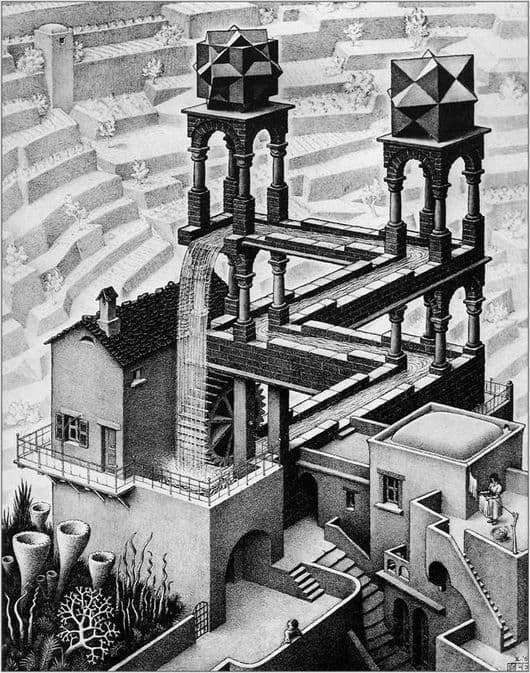 Lithograph “Waterfall”, written by the Dutch artist Escher in 1961, the design of which is based on the impossible triangle of Roger Penrose. Such a triangle consists of three boards (crossbars), each of which is laid at right angles to the other. The waterfall itself in the picture looks like this: the water falling from the uppermost tower turns the wheel, which then directs the same water to the top of the structure. In general, the operation of such a mechanism is impossible according to the law of conservation of energy, more precisely, even if the wheel is started by water, then after a while the mechanism will inevitably stop. Simply put, the work of such a waterfall is impossible, like a perpetual motion machine. Quite unusually arranged path along which water rises. The columns located at the corners of the groove, in fact, do not rise up, as it seems at first, but abut the track, forming a few more Penrose triangles. Even the upper turrets are not on the same level, but with a difference of at least half a floor. In general, water, if you forget about the columns and the waterfall itself, clearly flows along a plane or even with a downward slope. But, somehow, in the picture after the execution of the cycle, it appears above the wheel and pool, from which it flowed into the distance. All elements of the picture are drawn without perspective, which allows to achieve interesting optical illusions and impossible figures. The waterfall in the picture is a structure that is located next to houses and extraordinary plants. Everything around him looks quite normal, and the woman standing on the roof of the house on the right, at all, calmly hangs out to dry her laundry. Escher was created more than one paradoxical drawing, and many of his works cause a person to get lost while trying to present the objects of his paintings in reality.